A few days ago Edwin and me had some employees from RES software visiting us, giving us a demo of the RES Powerfuse and RES Wisdom products. While both these products introduce interresting features, RES Powerfuse is the one I would like to eleberate on since this product has potential within the virtualisation world. What RES Powerfuse does is breaking the tradition of user profiles beeing stuck to a single platform. Up until now you would have multiple user profiles for FAT clients, terminal services or other combinations imagenable. This would force the administrators to create scripts and policies for each induvidial OS. A process that leaves room for errors and inconsistancies, which can end up in multiple different user workspaces for the individual user. With RES Powerfuse you can manage the entire user workspace with a single tool. Like said it breaks the old way of providing user workspaces and detaches the user workspace from the OS. By doing so it is possible to use a single user workspace on multiple OS’s, providing users with a single indentical workspace no matter the OS. 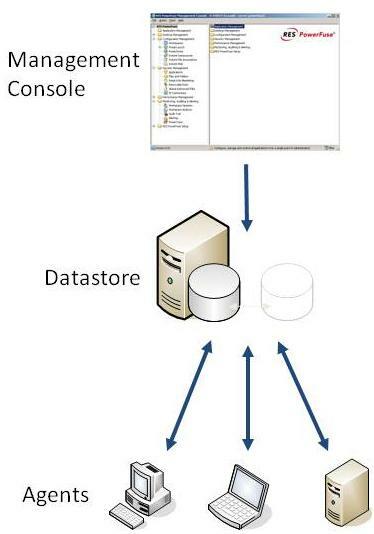 The settings for a user are not stored on the OS itself but reside in a database. When a user logs on to an OS the RES Powerfuse agent (which should be installed on the OS) either downloads the settings from the database and applies them or it takes the settings from its local cache, making logging on a even faster proces. At the end of the presentation we got some demos on how the products are working. One feature that really got our interest was the “Workspace extention” which is part of the RES Powerfuse product. What it does is merge local applications and a remote desktop into a single workspace. This eliminates the need to switch between a local and remote desktop. 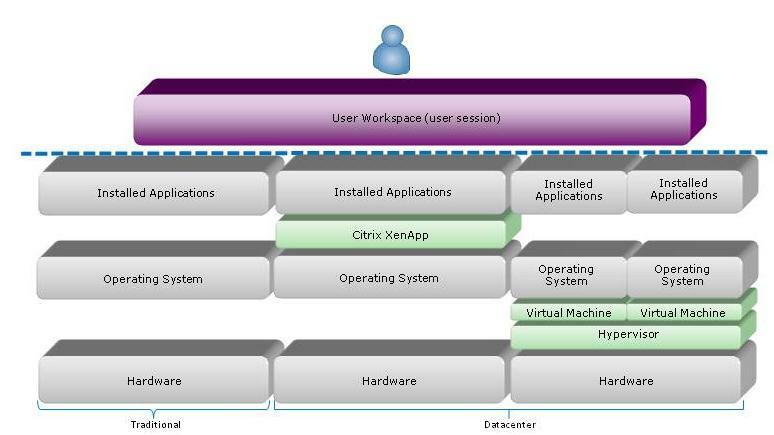 Imagine having a FAT client on which AutoCAD is installed but for the office products the user needs to create a remote desktop session, for example Citrix XenApp or VMware view enviroments. This user would then need to switch between the local workspace and the remote workspace. Workspace extention enables the user to start (the shortcut to the application is provided in the remote workspace automatically) AutoCAD in the remote workspace as if it where installed on the server providing the remote workspace. This effectively eleminates the need for the user to switch between workspaces. There are many other features available within RES Powerfuse that can make the user experience improve. The link provided below takes you to a comparison sheet for the different features in the RES Powerfuse versions available. Both Edwin and me where pleasantly surprised by what the RES software products can provide for both users and administrators. And we both thought up on some situations or clients where these products can make a difference. 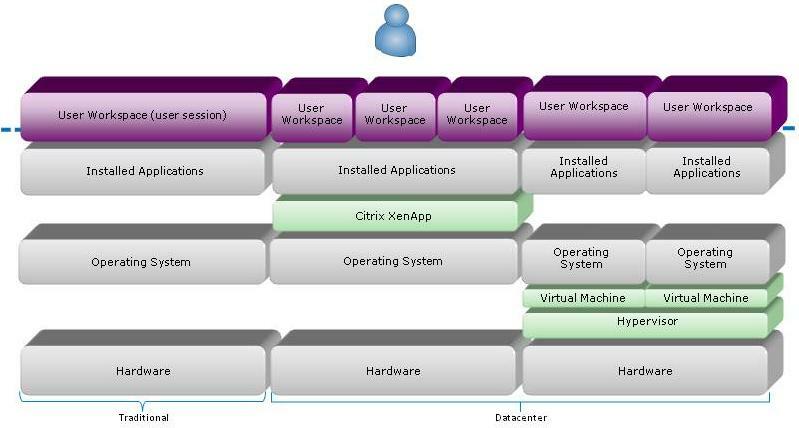 For example think of a VMware view enviroment with linked clones. Or what about non-persistant desktops. And even deploying a new OS can be made much easier when you don’t have to take user settings into account.